For Centuries, it’s Been a Favourite in the Caribbean, But is Coconut Water Good For You? Coconut water seems to be very much in vogue this year. It’s taking pride of place in supermarkets and health food stores all over the UK. Celebs like Sienna Miller, Gwyneth Paltrow and Rihanna have been seen drinking it and it’s reported that Madonna has invested hugely in a major coconut water company. But is it just a celebrity trend? Is coconut water good for you and what are the health benefits? We have already talked about the benefits of coconut oil, and coconut milk, which is obtained from the flesh of the coconut, has long been a staple ingredient in curries and oriental cooking. However, coconut water is relatively new to those of us living in cooler climates. Coconut water facts: The brown coconuts we know well are mature nuts. The best coconut water comes from green coconuts aged 5-7 months. Coconut water is the liquid contained in young, green coconuts. 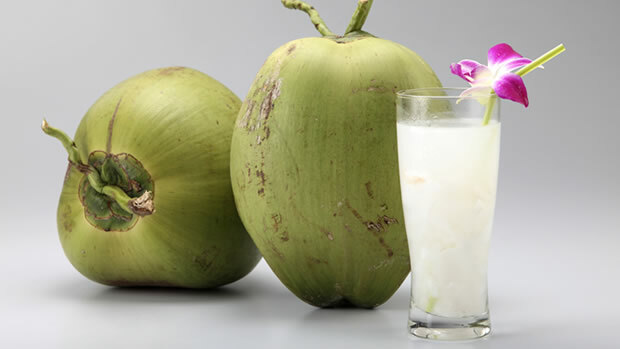 It’s a clear, sweet liquid with many nutritional properties and has long been used as a refreshing drink in tropical climates where the coconut is indigenous. Coconut water is extremely low in fat, is high in fibre and potassium and contains simple sugars, vitamins, minerals, enzymes, electrolytes and amino acids. So what does this all mean in simple terms? Low in fat: Coconut water is very low in fat, to the point where it’s almost fat-free so will not affect your saturated fat intake. Pure coconut water contains about 20 calories per 100ml and most of that is obtained from the sugars contained in the liquid. If you’re including coconut water in your daily nutritional intake, be sure to track it in your Food Diary. High in fibre: Coconut water is a good source of fibre and contains about 3% of your daily intake per 100ml. In many countries, coconut water is drunk as a cure for constipation or bowel problems. Contains potassium: Coconut water contains potassium, which benefits brain and heart health, fluid balance, muscle and nerve function. Many fruits and vegetables contain potassium but coconut water has a higher level than many, including the old favourite, bananas. Vitamins: Coconut water also contains Vitamin C and Riboflavin (B2). 100ml contains 4% of your recommended daily intake of each. Minerals: Calcium, Iron, Magnesium and Zinc are all part of the coconut water cocktail. These are instrumental in boosting the immune system and keeping the body strong. Coconut water facts: Coconut water is the only liquid that is compatible with human blood. In third world countries, it has been used intravenously to rehydrate in emergencies. Rehydrates – coconut water contains electrolytes that quickly rehydrate the body, making it an excellent choice if you have been ill. It’s gentle on the stomach so if you have been vomiting, it should ease any queasiness or nausea. Aids digestion – Coconut water’s high fibre content makes it an ideal choice if you have digestive problems like constipation or need to maintain a high-fibre diet. It also helps with indigestion and acid reflux. Balances electrolyte levels – drinking coconut water in the morning is said to help balance the electrolyte levels in your body. This is important for maintaining a healthy blood pressure. High in nutrition – coconut water’s nutritional qualities make it a healthier drink to fruit juice-based drinks. It contains a lower level of sugars and is suitable for both adults and children. Coconut water could be a healthy choice to add to your child’s lunchbox. Good for the skin – your skin won’t just benefit from drinking coconut water. You can make it part of your beauty regime too. Coconut water is said to help with acne and oily skin. Try using it as a toner and follow with coconut oil to moisturise for a complexion you will go nuts for. It’s no wonder so many beauty products contain coconut. Anti-ageing – coconut water contains cytokinins. These are anti-oxidants that protect from ageing and cancer. Coconut water facts: Got that ‘morning after’ feeling? Coconut water makes an excellent hangover remedy. It’s easy on the stomach and the high level of electrolytes aid fast absorption into the body. Unless you are lucky enough to live in the tropics where you can drink coconut water straight from the nut, you will be buying coconut water ‘off the shelf’. Be label aware and look for pure coconut water. The fewer ingredients there are on the label, the purer it will be. Many coconut waters have juice or sugars added for flavour but these aren’t always necessary. Feel free to enjoy them in moderation and track them in your Food Diary. However, if you are looking to contain your sugar intake, choose pure coconut water. Coconut water facts: Hailed as ‘nature’s sports drink’, coconut water is often used by athletes as a healthier alternative to energy drinks for its fast-rehydrating and energy-giving qualities. In conclusion, there are many nutritional and health benefits of coconut water. It’s fat free and low in calories so you can enjoy it as part of a balanced diet and as a healthy alternative to fruit juice and fizzy drinks. While water will always be the healthiest drink, there’s no harm in enjoying the coconut water craze while it lasts.